A collection of variations on the story of a boastful miller and the daughter he claims can spin straw into gold. Bulletin of the Center for Children's Books "Blue Ribbon Award"
The author's note at the beginning tells the truth: the more I thought about the story of that miller, that daughter, and that strange little man with the unlikely talent of spinning straw into gold--the less it made sense. I wrote one version, and that was published in Tales from the Brothers Grimm and the Sisters Weird. I really enjoyed playing with all those fairy tales, turning things on their heads, making the character usually thought of as the villain be the good guy, or starting earlier than the traditional story starts, or going on beyond the usual end. But then I told my friend Ellen Stoll Walsh that the Rumpelstiltskin story is so mixed up someone could write a whole book of different stories based on its plot. Ellen laughed and said, "Certainly a story or two, but surely not a whole book." I considered that a challenge. Gregory remembered the miller. He sighed in exasperation that the annoying man had sent his poor daughter all the way here for nothing. And apparently on foot. But he couldn't just tell her that; he couldn't say: "Walk back home even though it's the middle of the night. Your father was wrong. I don't want to meet you." Instead he leaned over the wall and called to the porter at the door, "Let her in. See that she has a comfortable room for the night and that she's given something warm to eat." "Yoo-hoo! Your Highness!" Carleen's voice called. Gregory returned to the wall. "Don't forget the spinning wheel." Carleen put her hand on her hip and said, "Well, duh. First you expect me to spin straw into gold, then you expect me to do it without a spinning wheel?" "But I don't--" Gregory started. "Well, duh," Carleen repeated with even more scorn in her voice. Gregory told the captain, "Get her whatever she needs." "Yes, sire," the captain said. "Good night, Your Highness," Carleen called up to him. "Don't you worry about me, walking all yesterday afternoon, then sleeping out in the woods, then walking all day today. I'll stay up all night spinning that straw into gold for you. Don't you give me a second thought." "Good night, then," Gregory called to her. He sincerely hoped she'd be gone in the morning. The Rumpelstiltskin Problem has been published in Japan. For more fractured fairy tales, read Tales from the Brothers Grimm and the Sisters Weird. For suggestions on making reading out loud a fun experience, take a look at Children's Book Corner: A Read-Aloud Resource with Tips, Techniques, and Plans for Teachers, Librarians, and Parents, Grades 5 - 6 (published by Libraries Unlimited/Greenwood Publishing Group). (Other books in the series feature other grade levels.) There are read-aloud plans on how to select the right book and how to get listeners more involved with the story--which makes them come away with a deeper understanding of what they've just heard. 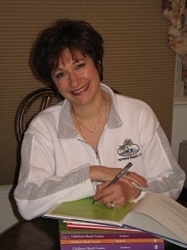 Author Judy Bradbury has featured The Rumpelstiltskin Problem, and includes an interview with me. As part of Scholastic's Read 180 program to tackle the problem of adolescent illiteracy, The Rumpelstiltskin Problem has been released as a fun audiobook at level Stage C (high school). 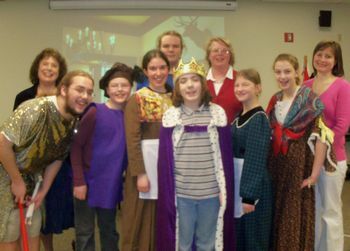 With the Drama Kids International of Rochester cast in a production of "Straw into Gold" at the Fairport, NY Library. Another cast, another DKI production, this one at the Penfield, NY Library. Scholastic has put together a lesson plan for The Rumplestiltskin Problem. To see that, click here.